Good lord has it been an awfully eventful month. Thus, the EXTREME lateness of this post. I’ll tell you about it later. So first, I would like to talk about some of the best mac and faux cheese I’ve ever made . . .
What makes it soooooo goood? Teese vegan cheese alternative! (Ok, that sounded like a commercial, I’ll stop, I promise.) But seriously, I love teese. It’s one of the best anti-cheeses on the market. It melts well, tastes pretty darned good, and for the most part, looks like dairy cheese. Dare I say that it is omni-safe. And our friends at Chicago Soydairy sent me some for free! 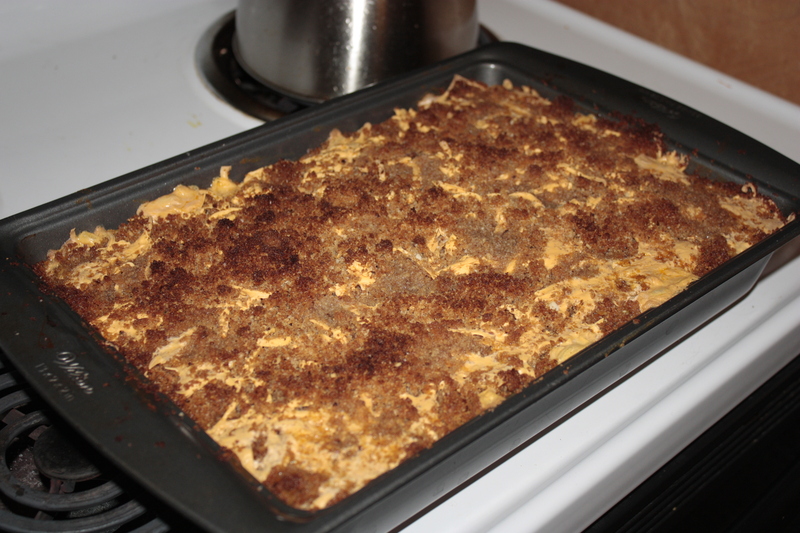 So I just had to make some seriously kickass mac and teese with it. Grease either a 4-quart casserole or a 13x9x2 inch pan. First we make the tofu ricotta. Wrap the tofu in a few layers of paper towels and squeeze out the water. You don’t have to worry about getting it as dry as you would if you were going to fry it, you just don’t want watery tofu ricotta. 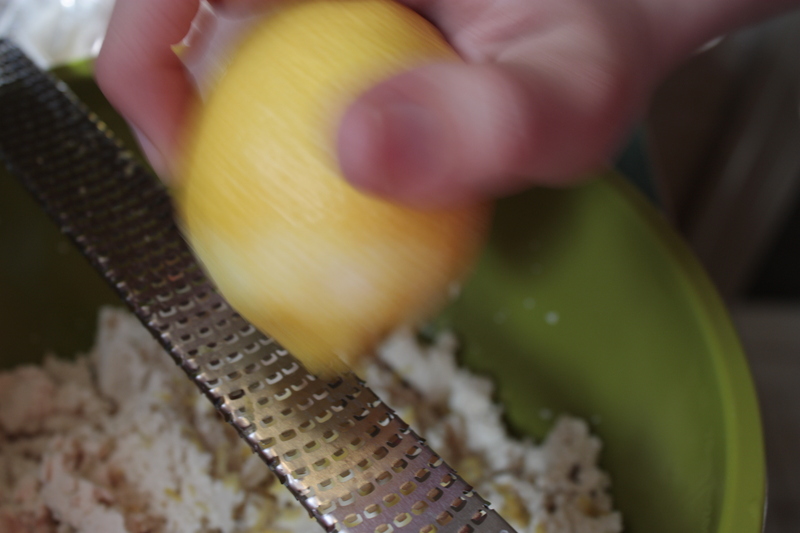 Crumble the tofu into a medium bowl and add the lemon zest, lemon juice, garlic powder, onion powder, salt and olive oil. Stir with a fork, breaking the tofu up a bit more, until very well combined. Set this aside to marinate. 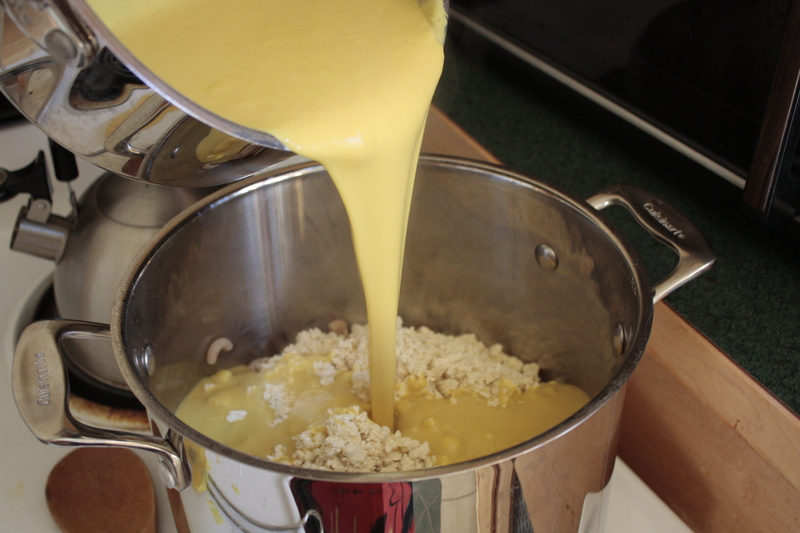 For the macaroni, fill a large stock pot about 2/3 of the way with water. Add a tablespoon or so of salt and put this on the stove to boil. 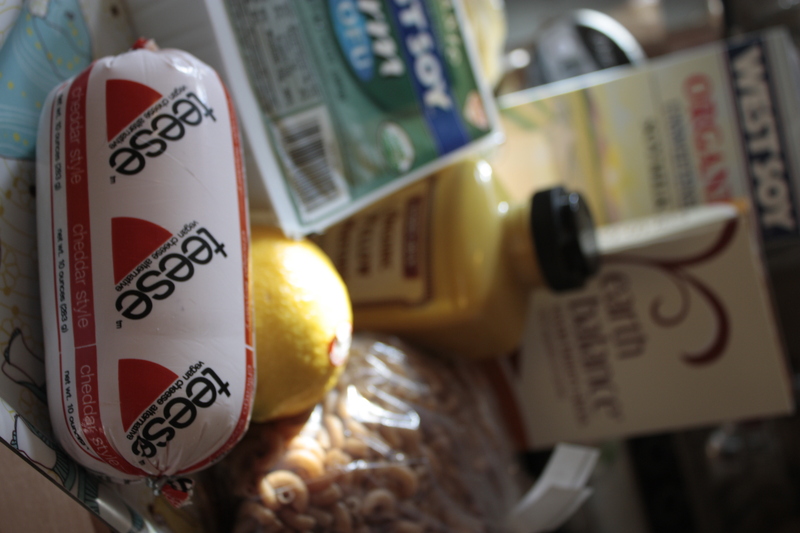 While the water is coming to a boil, start the nutritional yeast sauce. In a large, cold saucepan, combine the flour, corn starch, salt, garlic powder, onion powder, turmeric, paprika, and nutritional yeast. Mix very well and then whisk in soymilk. Put the pan on the stove over medium heat. Cook, stirring frequently, until it comes to a boil. Simmer this for 2 or 3 minutes and then turn off the heat. Whisk in the margarine and mustard and set aside. Season to taste with salt and pepper. Whenever the water starts boiling, add the macaroni and cook according to the directions on the package . . . or just guess. Mine took about 8 minutes. Cook until just past al dente. You want the macaroni done, but not over done. Drain all the water, rinse the pasta in cold water and return to the pot. Mmm saucy . . .
Add the tofu ricotta to the macaroni and pour the nutritional yeast sauce on top of that. Stir it all up and set it aside. 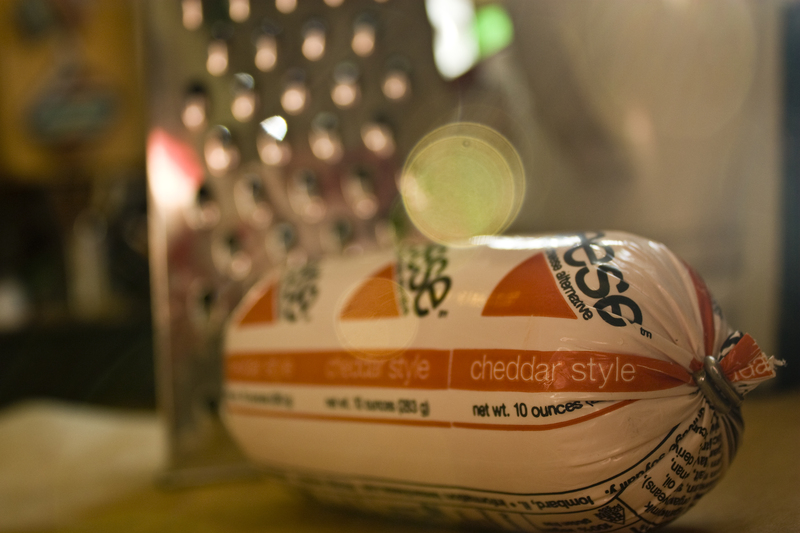 Grate the cheddar Teese on to a piece of parchment paper to keep it from sticking to things. You ought to get about 2 cups out of the log o’ Teese. 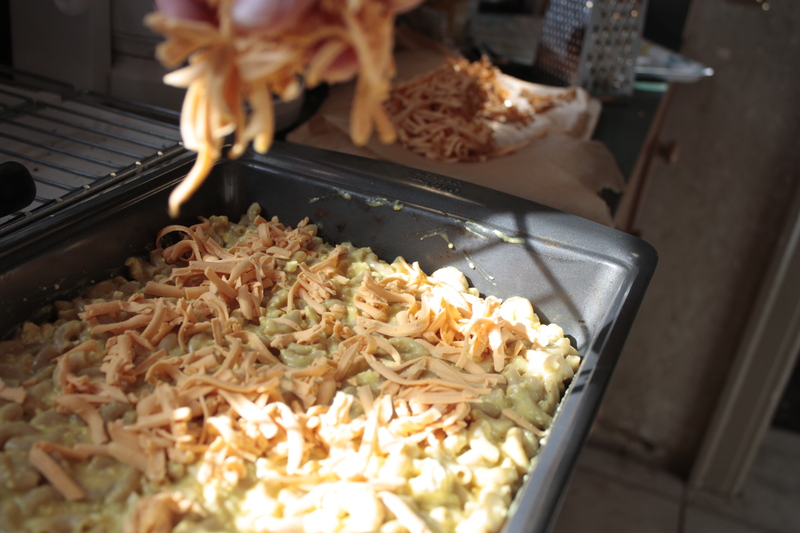 Now take your macaroni/sauce/tofu mixture and pour about half of it into your greased baking dish. Smooth it out. Sprinkle about half the Teese on top of the noodles. Carefully spoon the rest of the macaroni mixture on top of this, being careful not to disturb the Teese too much, and smooth it all out. If you are making this dish ahead of time, you can stop here, cover the baking dish, wrap up the remaining Teese and leave it in the fridge up to 24 hours. Put the dry breadcrumbs in a food processor (or use the food processor to create them and just leave them in there). Cut up the cold margarine and disperse that in the food processor. Season the breadcrumbs with a bit of salt and pepper. Pulse everything in the food processor until crumbly and well combined. Sprinkle about half the breadcrumbs evenly on top of the macaroni, making sure to get the crumbs all the way to the edges. On top of this layer, evenly disperse the rest of the Teese, again being sure to get it along the edges so it gets all crusty and brown and tasty . . . mmm. 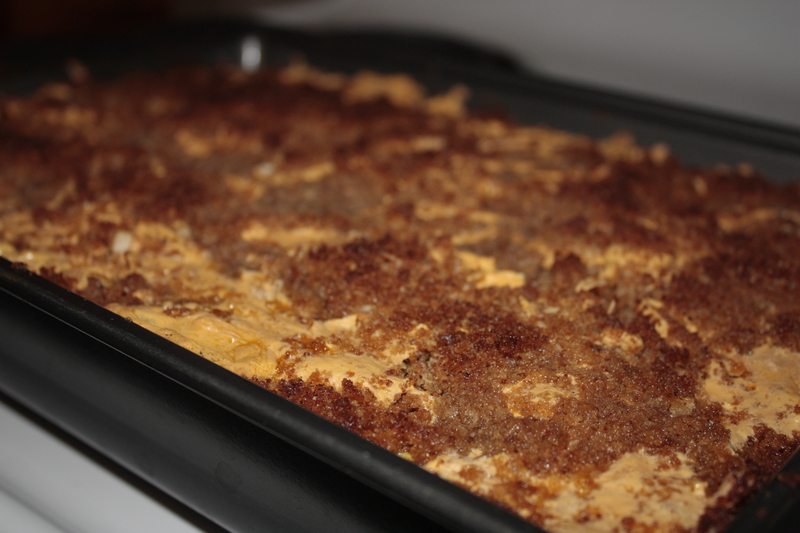 Lastly, sprinkle the rest of the breadcrumbs on top of the Teese. All done! Om nom nom . . .
Cover the baking dish and bake at 400 degrees for 30 minutes. Remove the cover and bake for another 20-25 minutes, or until the top is nicely browned and the Teese on top is melty. Remove from the oven and allow to cool for at least 10 minutes before serving. Serves 6-8 as a main dish 8-12 as a side. Or just one with lots of leftovers. I brought this dish to a potluck for the philosophy department. More than one of my professors asked if they could take home some leftovers. I think that makes this dish a success. It’s definitely an omni-safe vegan mac and cheeze, which you don’t find many of. And it’s all thanks to teese! Yummy, yummy teese. 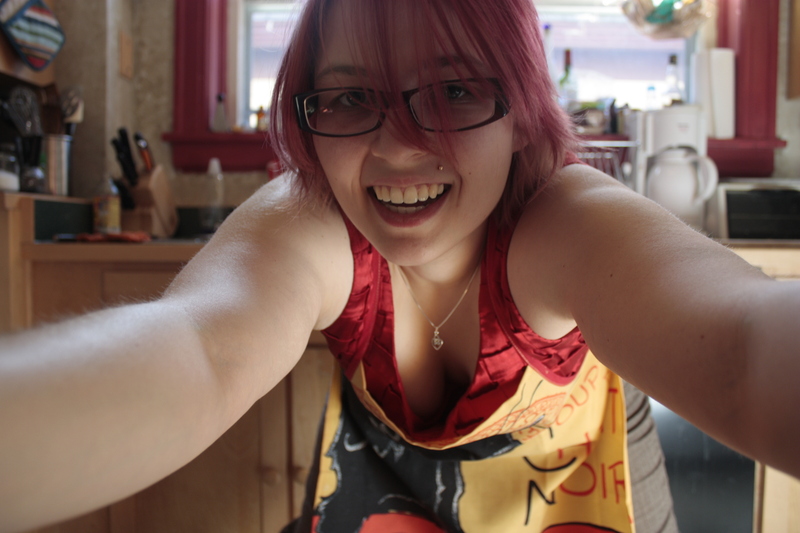 Here’s a shot of my happy macaroni face! Macaroni and teese makes me so happy!